[By Nick, 2012 only] After my positive experience with BH’s mix of mint and cookies and cream ice cream, I thought it was about time to give a national brand’s rendition a try. 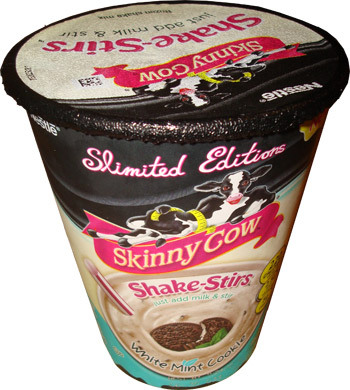 Looking through the freezer section my selection was pretty limited but I did manage to spot the new for 2012 limited slimited edition shake from Skinny Cow. Dubba took a look at the other variety early last year, so it felt might that I should cover the mint version. 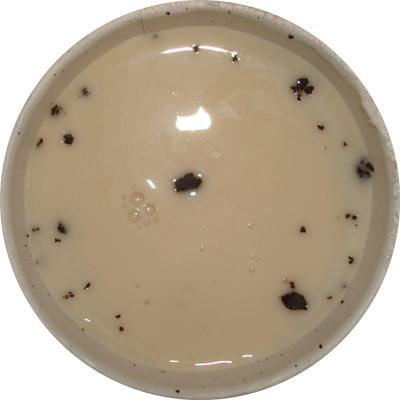 The White Mint Cookie Shake-Stir is described as “Low-fat mint ice cream mixed with chocolatey cookie crumbles” and so seems pretty straight forward. It is called white mint so I do enjoy the fact it’s not the green color that you’d associate with mint ice cream. There’s just something about green ice cream that bugs me every now and again (yes I’m talking about you pistachio). Right off the bat you can see that the freezer got the better of this one. There’s a bit of ice on top of the ice cream which isn’t all that surprising with the low fat ice cream. The directions call for a third of a cup of skim milk but just like Dubba, I don’t use that stuff. So instead we’re going to try this one with almond milk. After putting in the milk, it turns into a kindergarten science fair project and starts slowly bubbling, which was interesting to say the least. After some mixing (with a chop stick), you end up with a fairly thick shake. Taking a bite, the best way I can describe this one is a mint version of a frosty. 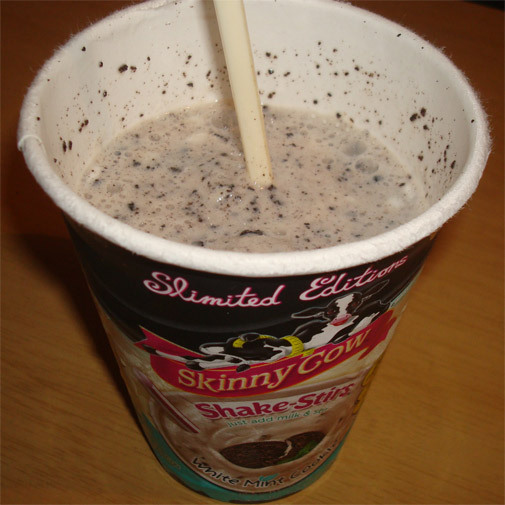 It’s not quite as thick as a shake but also not a smooth as soft serve. The mint flavor in this one is very pleasant and refreshing. 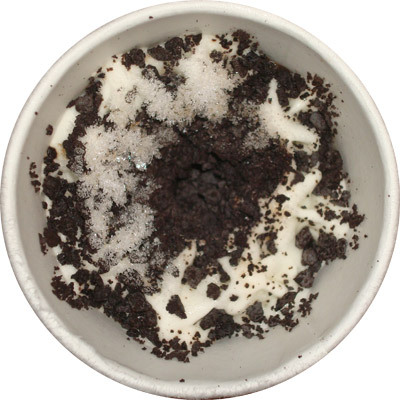 The little cookie bits add a nice contrast in texture and taste. Their crunch is respectable and the bitterness they bring plays well with the mint base. 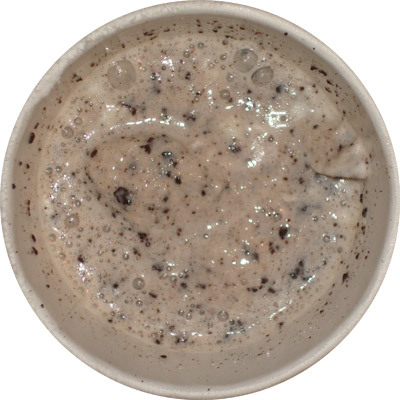 My major complaint is with all that ice that was originally there, you run into a lot of ice crystals throughout the shake. I could see this truly being a well put together product if I was to get a container that wasn’t tampered with by the freezer. Verdict? It could’ve been better if it was able hold up to the freezer at my local supermarket. Buy Again? Maybe, only if it was on sale though. If I got another one full of ice, I’d be pretty annoyed.